Please make cheques payable to Quarantine. *In 2004 we made a show at Tramway in Glasgow called Butterfly. The performers were 3 generations of the Waterman family who lived not far from the venue. The performance took the shape of a large-scale family party, including cash bar, a buffet halfway through, dancing and home-videos of previous parties. Above the performance space were 250 mirrorballs. Immediately after the performance, a number of the mirrorballs went missing. We sold some to other venues, including – see invoice above – The Arches in Glasgow. The Arches closed in June 2015 due to licensing issues. For a while, the rest of the mirrorballs lived in the basement of our designer Simon Banham’s house near Aberystwyth. In the 14 years since our show, the Butterfly mirrorballs – small, medium and large – have been dispersed around the UK, and maybe further. We’ve lent them, sold them, given them away. There are currently 9 in the house we’re renting for our Tenancy project. 2 remain in storage. I’m looking at 1 now flown above the Wallflower set, ready for another performance. We recently gave 1 of the small ones away to artist Nic Green. 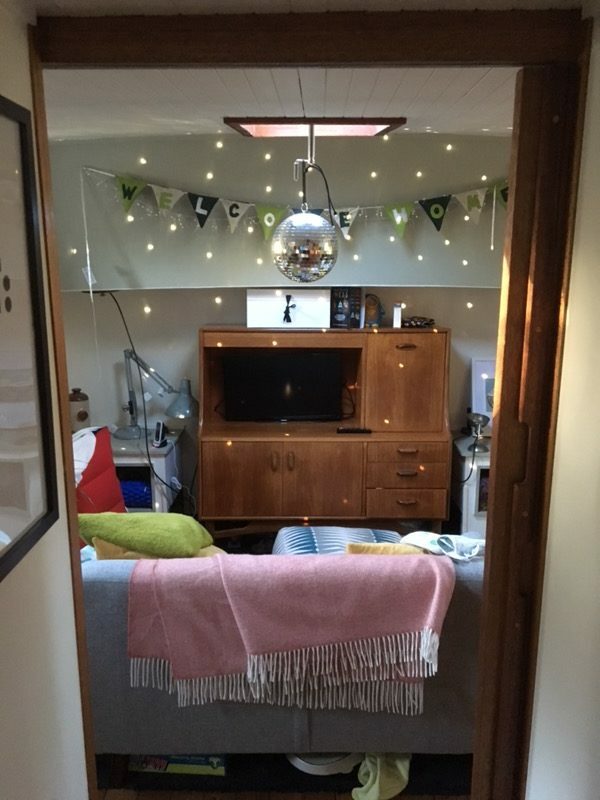 Her young son was entranced by the light bouncing off the mirrorball, so, somehow appropriately, it’s gone back to Glasgow, installed on the boat they live on…. If you own or know where an ex-Quarantine mirrorball is, please send a description to info@qtine.com. We don’t want them back. We won’t prosecute. A photo would be nice.